Pinnularia is very common in fresh water ponds, ditches, on the surface of mud in the drying ponds and on the moist soils. 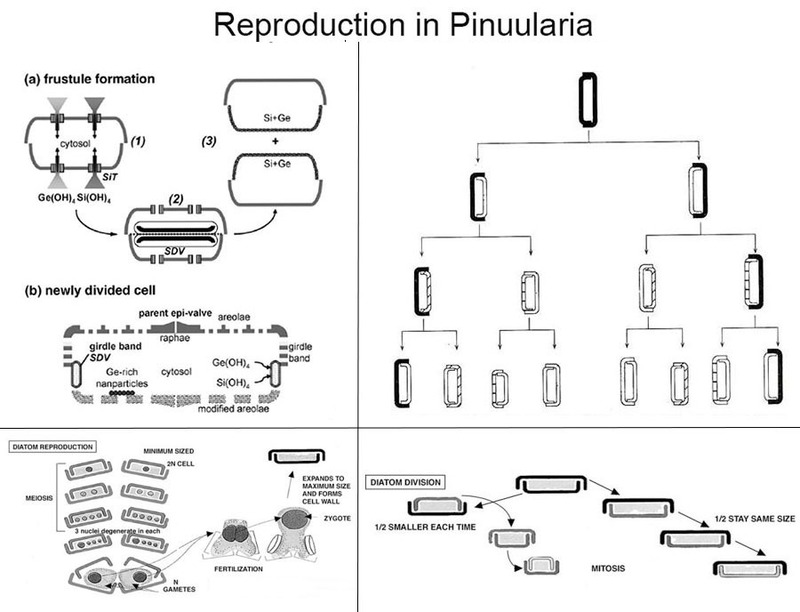 The Taxonomic Positions, Structure, Reproduction of Pinnularia are as follow. The plant consists of single cell, which is elongated or elliptical in outline. The cell is 7-8 times as longer as broad. Under the microscope it gave following demarcations. The outer covering of the cell is called as cell wall. The cell wall is made up of pectic material which is impregnated with silica. So, the cell became very hard. The frustules consist of two overlapping halves called the valves. The flat view is called as valve view while the band view is called as girdle view. The two valves instead of overlapping each other directly, are attached to each other by incurved edges of the valves called girdles or connecting bands. When viewed either from above or below, the valve view, the cell usually has parallel sides and rounded polar portions and when observed in lateral aspect, the girdle view, the cell appears rectangular. It is characteristic marking and present on the valve view. Each valve of Pinnularia is marked by two series of prominent rib-like lines, the costae which extend from margins to the central region of the wall. The central region of the wall is traversed by a cleft or groove called the raphe. The raphe is not straight but is sigmoid in shaped. The raphe is not continuing but it is interrupted in the middle by a circular thickening called the central nodule. The thickening is also present on the outer end of raphe and is called as polar nodule. The cytoplasm is arranged in a parietal layer, inside the cell wall and enclose a large central vacuole. The single nucleus is suspended in the center of the vacuole by a cytoplasmic bridge. There are two laminate chloroplasts embedded in the cytoplasm. These contain a pigment called as diatomic in addition to the normal photosynthetic pigments. One or two pyrenoids are present in each chloroplast. The chief food reserve is in the form of oil drops. 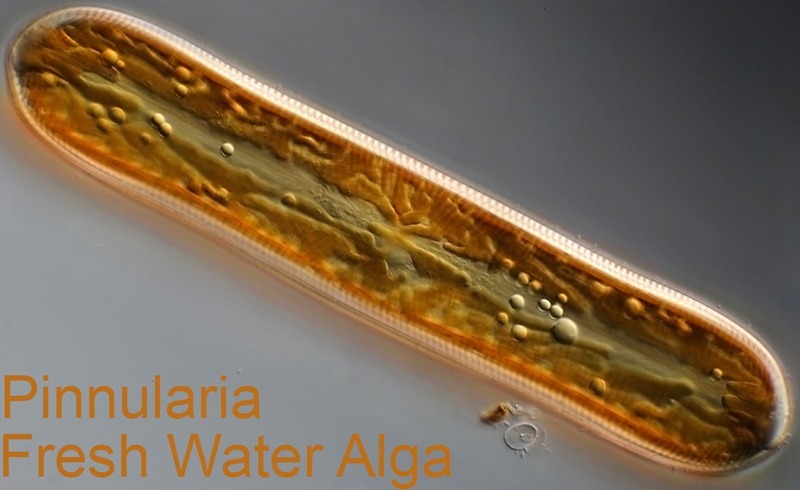 The most conspicuous of cytoplasmic structures are the brownish plastids which contain chlorophyll-a and -c, beta-carotenes and a number of xanthophyll’s including the fucoxanthin which masks the chloroplasts and is responsible for the characteristics color of the plant thallus. The plastids are few in number and are massive. The excess food is stored in the form of oil or chrysolaminarine Electron microscopy has revealed the presence of mitochondria and Golgi bodies. The plant exhibit characteristics gliding movements. which are brought about by circulation of streaming cytoplasm within the raphe and by the secretion of the mucilage through the raphe and its hydration. The plant reproduces vegetatively by cell division and sexually by production of auxospores. This is the most common method of reproduction that results in the formation of two daughter cells of slightly different size. The first indication of division, is expansion of the protoplast that causes a slight separation of overlapping epitheca and hypotheca. This is followed by mitotic division of the nucleus in a plane perpendicular to the valves. The nuclear division is accompanied with duplication of cell organelle especially those of chromatophores and pyrenoids. Later, the protoplast divides in a plane parallel to the valves. One daughter protoplast lies within the epitheca and the other within the hypotheca. Each daughter protoplast secretes a new half next to its girdle and free face. At this stage the parent connecting bands separate and each cell becomes an independent cell. The two frustules of each parent cell act as epitheca of the two daughter cells. Therefore, newly formed half wall is always hypotheca of daughter frustule. The utilization of two old half walls as epithecae for the daughter cells results in one cell of the same size as the parent cell and the other being slightly smaller than the original parent cell. This progressive diminution in size result in a population with smaller cells, however this reduction in size does not continue indefinitely. It is checked by formation of auxospores which give rise to vegetative cells of maximum size for the species. The sexual reproduction is isogamous and is influenced by various factors like temperature, light conditions and nutrition. The Pinnularia species are monoecious. The zygote grows into a specialized spore, the auxospore which enlarge to the size of the parent cell and restores the parental size of the vegetative cell. 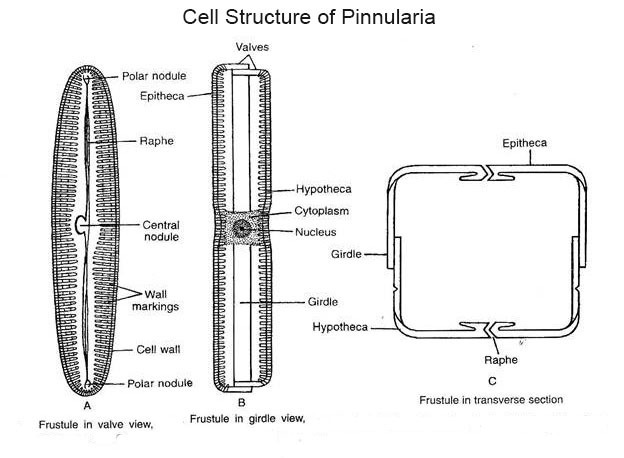 In Pinnularia two cells from common parent or different parents become enveloped in a common mucilaginous sheath (conjugation). The nuclei of both cells divide by meiosis to produce four nuclei, out of which three disintegrate and the surviving one enlarges. The protoplast metamorphoses into a gamete. The gametes are liberated from the parent frustules and fuse to form a zygote which enlarges to become an auxospore. The auxospore secretes new valves to become an adult.